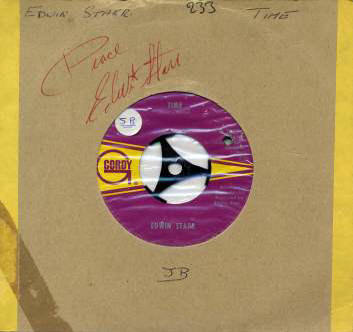 Born Charles Edwin Hatcher on 21st January 1942 in Nashville, Tennessee, Edwin went to Detroit in 1962 and became one of the artistes on the newly formed Ric Tic label run by Ed Wingate. The pair collaborated to release classic songs like 'Agent 00 Soul', 'S.O.S' and 'Headline News'. 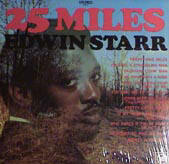 Edwin's wasn't like the rest of the Motown family. He stood out from the norm with his incredible rough voice that was almost a shout and unusually, he co-wrote some of his own numbers. Producer Norman Whitfield who was working with the Temptations and Gladys Knight amongst others, was looking for a particular type of voice for the re-recording of 'War'. Edwin and the single shot straight to number 1. 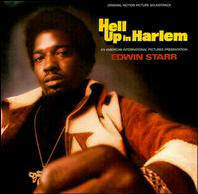 Nominated for Grammy Awards on two occasions, once with "Agent 00 Soul", Edwin received the accolade of having "H.A.P.P.Y Radio" in the Hall of Fame. 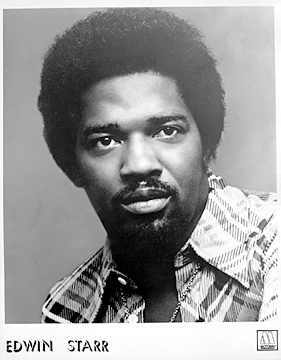 There could not have been a sadder loss than brother Edwin Starr on the 2nd April 2003. Messages of condolence on his web site spoke volumes about the high esteem in which he was held throughout the music world, but especially within northern soul and Motown circles where his music will live on forever. For those of you who had the pleasure of meeting him will remember just what a friendly and unselfish person he was, who always took time out to speak with his many fans and nothing ever seemed to be too much trouble. 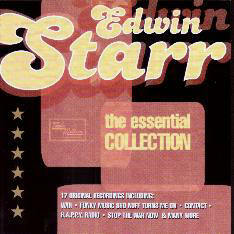 I was first introduced to Edwin personally in October 1994 after requesting that he join me in a radio studio where at that time I was presenting a soul and Motown show, and not only did he accept my offer to be part of that show, we actually ended up doing the whole three hour programme as an Edwin Starr ‘special’ – for which he didn’t charge me a single penny. 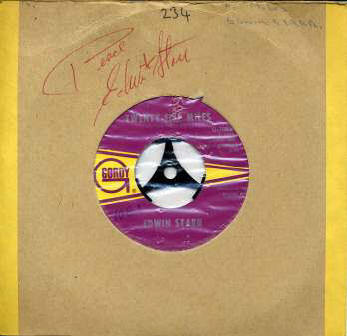 In addition to that, he made three personalised jingles for me and I am extremely proud to own the master tapes to that show that featured all of his work at Motown and Ric Tic, which now takes pride of place on my personal Motown web site. We will all remember in our own special way the times that we saw him perform live around the UK. From the days of the Twisted Wheel where he was a regular visitor, to the California Ballroom in Dunstable, The Golden Torch at Tunstall, Wigan Casino, and countless other venues where he performed regularly. 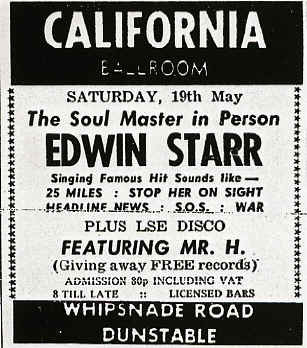 Whilst James Brown has commanded the tag of being the hardest working man in show business, I would argue that Edwin could easily have qualified for that accolade too. We will all miss Edwin and life on the soul scene will never quite be the same anymore although his legacy of music will continue for many years to come. Life seems to have a cruel habit of taking people from this earth without warning, and I know that everyone reading this tribute will have their own special memories of this great man. At the young age of 61 this was a cruel blow to deliver and sadly he has now been added to a long list of soul greats that have now departed from this earth and I am sure he will join the likes of Marvin, Tammi, Laurence, Shorty, Jackie Wilson, Curtis Mayfield, and Major Lance but to name a few in that great place in the sky where I am sure he will keep them entertained. It is ironic that his 1970 epic recording ‘War’ had a more powerful message than any other anti-war song of our generation and is one that will be in our hearts during this difficult time throughout the conflict in the middle east. 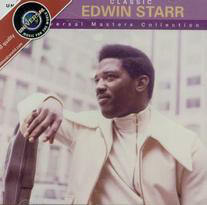 I had recently reviewed on this web site two of Edwin’s CD releases via Universal Music where they had coupled four of his classic albums over two releases. Sadly he will never know just how many copies were sold. 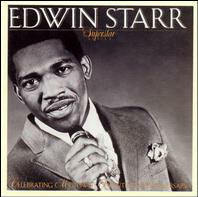 Edwin Starr was a unique artist the likes of which we will never see again, his boundless energy on stage, his powerful vocal delivery, and electrifying stage presence is an inspiration to all of today’s new breed of ‘soul’ acts. God bless Edwin – may you rest in peace. We will NEVER forget you. That says everything about Edwin as far as I'm concerned. How many other big stars would even contemplate signing their name on a sheet of toilet paper?